I can’t be sure, but I’m pretty sure that the photo of the start of the first Rock ‘n’ Roll Marathon in June of 1998 was not nearly as colorful as the 2012 edition. I know that I was wearing a white singlet, as was just about every else around me. February 3, 1959 might have been the day the music died, you youngsters can just Google “Buddy Holly” if you don’t understand the reference, but June of 1998 is when the Rock ‘n’ Roll Marathon series started, and with it a whole new generation of runners, walkers, and waddlers. I know. I was there. I went to the first RnR marathon as a member of the Runner’s World Magazine Pace Team. I can’t remember everyone who was there since all of them have left the magazine, but I remember that it was a motley crew of editors and writers and one new columnist. Me. As I recall the fastest pace team was for a 3 hour finish. It went up every 10 minutes through 4 hours, then went to 4:30 and 5:00 hours. I was, of course, the 5 hour pacer. I was new to writing, new to running, and very new to pacing. No one seemed to care. A few hundred of us lined up to run/walk/dance our way through 26.2 miles. And that’s exactly what we did. We ran some. We walked some. We danced some. And we laughed A LOT. It was sensational. I don’t remember the exact time we finished, but, I certain we missed the 5 hour target. Somehow it didn’t matter. We were having too much fun. Since that humble beginning the Rock ‘n’ Roll series has grown to over 20 events nationally, and at least 5 international events. 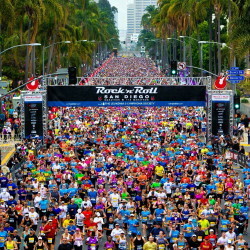 The 12,000 of us who lined up in 1998 gave rise to nearly 250,000 finishers of Rock ‘n’ Roll events in 2011. It’s an amazing tribute to the vision of Tim Murphy, then president of Elite Racing, and his capable gang of followers. I’ve been at every Rock ‘n’ Roll marathon since. In 1999 my son, Terry, and I rode motorcycles from New York City to San Diego and then ran the marathon. In 2,000 I spoke for the first time at the Team in Training Inspiration Dinner, and I’ve been with the Team ever since. Many of the years run together – pun intended. There were great years, hot years, cool years, fun years, and some that were brutal. The year I finished so exhausted that I sat in my car for nearly an hour before I could find the strength to change clothes. But no matter, it was a rockin’ good time. This year I interviewed Olympians Jim Ryun, Ryan Hall, Rod Dixon, Deena Kastor and the legendary miler Steve Scott. I sat on stage with these extraordinary athletes and felt right at home. I was humbled to be sitting next to them, but I didn’t feel out of place. I had, like that had, earned the right to be there. I hope to be there for the 20th, or 25th. It will be fun to see folks running the marathon that weren’t even born when we ran the first one. I do appreciate the Rock ‘n Roll series for introducing so many people to the excellent sport of long distance running. But there are times when I feel like the organization is too focused on size. Plus, they’re definitely the most expensive race series outside of Disney and WMM races, which isn’t a huge selling point for me. However, I’ve only been on the running circuit since 2009, so I haven’t seen the development and expansion. 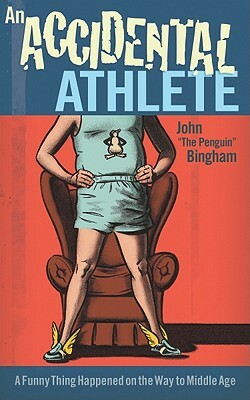 For me, it’s always been a huge series that seeks to emphasize celebrities running more than anything else. They do a great job of putting a race together though, so I can’t exactly harp on them for that (the 2011 Vegas race notwithstanding). Regardless, I enjoyed your reminiscing. I look forward to one day celebrating the 10th anniversary of my first long distance race. Until then, I have a lot of ground to cover. All right John, you talked me into another one. I love the RnR half in Seattle last summer, so I signed up for the full in St. Louis this fall. I’ll see ya there!